Welcome to historic Grand Marais, Michigan! The Grand Marais Historical Society operates three museums and a self-guided walking tour for our visitors' enjoyment. 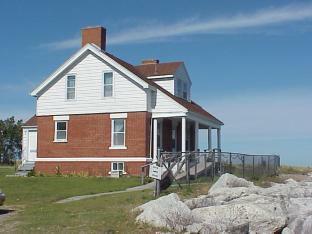 The Lightkeeper's House is located at the end of Coast Guard Point overlooking the channel. 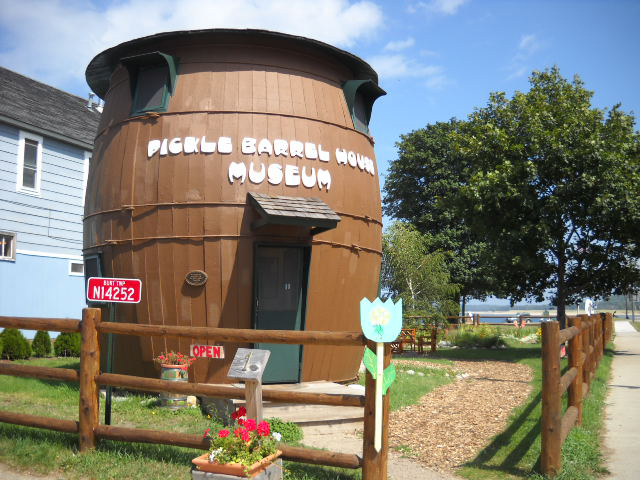 The Pickle Barrel House Museum is located on Lake Avenue right in the middle of town. The Old Post Office Museum, which opened in the summer of 2009, is also located on Lake Avenue in town. If you'd like to tour the town, the Promenade Through the Past self-guided walking tour will introduce you to 25 historic buildings and sites. Tour booklets are available at local stores and museums. We invite you to visit us and discover the rich history of Grand Marais! Calling All Cooks! We invite you to share your favorite recipes in our upcoming cookbook. Visit the Cookbook Information Page for details. The Light Keeper's House was built in 1906 by the Life Saving Service as the Lightkeeper's home. Previous to this, the lightkeeper lived in a homemade shack constructed of scrap lumber; it was described as "a miserable shanty" by the lighthouse inspector. The brick house was a vast improvement. During World War II, the Coast Guard took over the lightkeeper's duties. Their families lived in the house until the station closed in 1982. The Grand Marais Historical Society received the house in 1984 and began its restoration. Through the generosity of many donors, the museum now contains items that were in use at the turn of the century. Walking through the door is like stepping back in time. The Pickle Barrel House is one of the most unique structures in the country. It was built in 1926 as a summer cottage for author/illustrator William Donalhey and his wife, Mary. The cottage, which contains a living area, pantry, kitchen, and bedroom, stood on the shore of Sable Lake until 1937, when the house was moved into Grand Marais and placed on the corner of Lake Avenue and Randolph Street. For years it was a visitors information center, ice cream stand, and gift shop, and in 2003 the Historical Society purchased the building. It has been restored to its original condition as a summer cottage of the 1920s. Don't miss this very special place. Kids especially love it! The grounds of the Pickle Barrel House Museum is the home of a special garden of historic irises. The Pickle Barrel Historic Iris Garden, planted in the fall of 2009, is a registered Display Garden of the Historic Iris Preservation Society and features over 80 beautiful varieties of iris, many collected locally. The garden is open during daylight hours. Read about the garden in detail at the Gardening Gone Wild website. The Old Post Office was originally built about 1905 as a jewelry store. In 1907 it was added onto and put into use as the Post Office. The unique, five-sided structure served as the town's hug of mail and information for almost 70 years, and was placed on the Michigan Register of Historic Sites. Whent he post office moved into a different building in the 1970s, the little building was converted into a gift shop and beauty salon. In 2007, the new owners needed to move the building and donated it to the Grand Marais Historical Society. The town watched anxiously that August as Wolf Creek Excavating moved the entire building onto its new foundation on Lake Avenue. The Historical Society set to work renovating the building. In the summer of 2008, the exterior got a new roof and some new siding, new front steps, and a fresh coat of paint, all courtesy of local craftsmen Jeff Stevens and Brian Carter. In the spring of 2009, the interior was renovated and musem displays were installed. 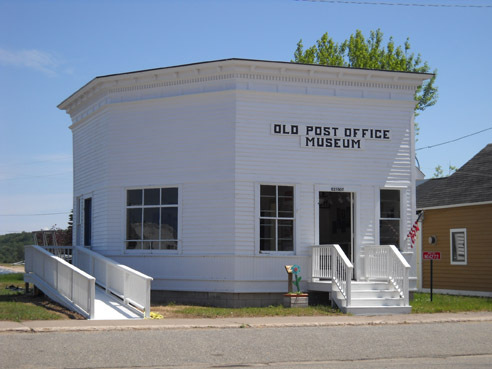 The museum opened to the public on July 25, 2009 and is now a walk-through museum of Grand Marais history, from its earliest days to the present. The museum is open daily in the summer. In the spring of 2010, the empty lot behind the Old Post Office Museum was transformed into a beautiful rose garden featuring northern-hardy roses especially selected for the climate in Grand Marais. Individual rose bushes were"adopted" in honor of someone, living or deceased. Honorees are listed on a special display inside the museum. The rose garden is in bloom from early June until frost. All three museums are open seasonally. During July and August, the museums are open daily from 1:00 pm to 4:00 pm; during the months of June and September, they are open on weekends from 1:00pm to 4:00 pm. Private tours can be arranged. For tour information, contact Historical Society President Pat Munger at (906)-494-2404. The name "Grand Marais" literally translates to "Great Marsh", but research has failed to locate a marsh here. On an occasional early French map it is shown as "le Grand Maré", meaning a safe harbor. In French, "Maré" and "Marais" are pronounced the same, and it is believed that "Marais" is a mapmaker error that came into common usage through repetition. Chippewa Indians lived or camped at the Grand Marais harbor for many years before the coming of the Europeans. It was the setting of many legends. This location was one of several places along Lake Superior that seem to have had special significance to the Chippewa people. The first French explorers are thought to have visited Grand Marais in 1619. However, there is no written record of their visit. In 1658, Pierre Esprit Radisson and Sieur de Grossiliers were brought to Grand Marais harbor by Indians. Radisson wrote in his journal, "...most delightful and wondrous for its nature that made it so pleasant to the eye [and] spirit". In 1899, Grand Marais was in its peak population years. The lumber camps and mills were thriving, and there was an active commercial fishing industry. The population was well over 2000, with probably another thousand people working in the lumbering camps surrounding the town. The harbor teemed with ships bringing in goods and people and taking out finished lumber products from the mills. A daily train ran from Seney and connected with other lines leading all across the nation. An active business community provided all kinds of services to the workers and their families. Grand Marais had doctors, lawyers, bankers, photographers, a hospital, an opera house, social clubs, good schools for the many children, hotels, boarding houses, restaurants, department stores, livery stables, churches, and a cigar maker, to mention just a few. In 1911 the lumber companies decided it was time to move on, and in May announced that the railroad would close in November. Residents packed their bags, locked their houses,and caught the train out. By 1915 there only about 200 people were left in the almost-abandoned town. In that year most of the business buildings along Lake Street were destroyed by fire. In the mid-1920s a highway was opened between Grand Marais and Seney and the motoring tourists discovered the isolated village. The dirt and gravel road served to link Grand Marais to the outside world, as the railroad had in earlier years. During the Great Depression of the 1930s, tourist cabins began to appear. Blueberry picking and fern gathering as well as commercial fishing helped families through the hard times. A new high school was buil in 1926, but little other new construction appeared until after the late 1940s. The Corps of Engineers worked on the pier in the 1950s and 1960s. Highway 77 was finally paved in 1958. Commercial fishing continued through the years into the 1940s, when it gradually changed into sport fishing. In 1964 the Michigan Waterways Commission constructed the marina on the site of the old Marais Lumber Company mill, and then gave it to Burt Township. In 1947, Trans-Canada Airways built an emergency airport with two mile-long runways southeast of town. When the airport was no longer needed, it was given to Burt Township. In 1966, legislation was passed forming Pictured Rocks National Lakeshore, creating a 67,000 acre park stretching 30 miles along Lake Superior to the west of Grand Marais. There is still selective logging in the area. Tourism is now the primary industry. It is becoming more year-round as visitors discover that the beauty of Grand Marais is a year-round pleasure. Interested in history? Love Grand Marais? Join the Grand Marais Historical Society and help us preserve our local history. Dues are only $5.00 per year for individuals, $10.00 per year for a family membership. We have a convenient membership form that you can print out and send in.